CHEF TALK: There are basically four layers to this cake: the batter, the cream cheese filling, the preserves and finally the topping, in that order. 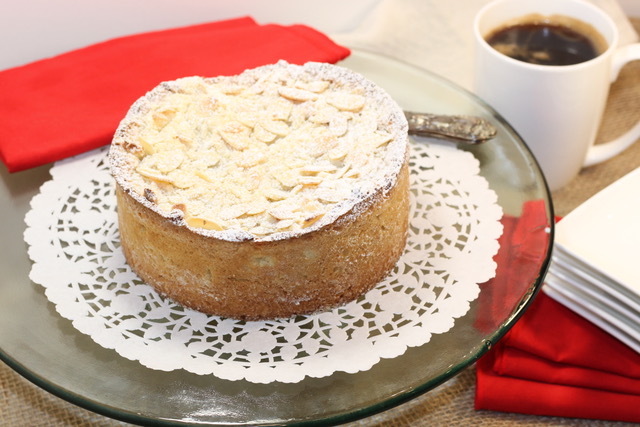 The layers bake together into the most delicious coffee cake you will ever try. It is special enough to serve for dessert. Preheat oven to 350oF. Grease and flour bottom and sides of a 9-inch springform pan. For the Cake: In a large bowl, combine the flour and the sugar. Cut in the butter using a pastry blender or fork and work into coarse crumbs. Important: Reserve 1 cup of the crumbs for the Topping. Into the remaining crumb mixture, add the baking powder, baking soda, salt, sour cream, 1 egg and almond extract. Blend well and spread the batter over bottom and 2 “ up the sides of the pan. The batter should be about ¼ inch thick on sides of the pan. For the Cream Cheese Filling: In a small bowl, combine the cream cheese, ¼ cup granulated sugar, 1 egg and vanilla extract. Blend well. Pour this mixture over the batter in the pan. Spread the raspberry preserves carefully by spoonsful on top of the cream cheese filling. 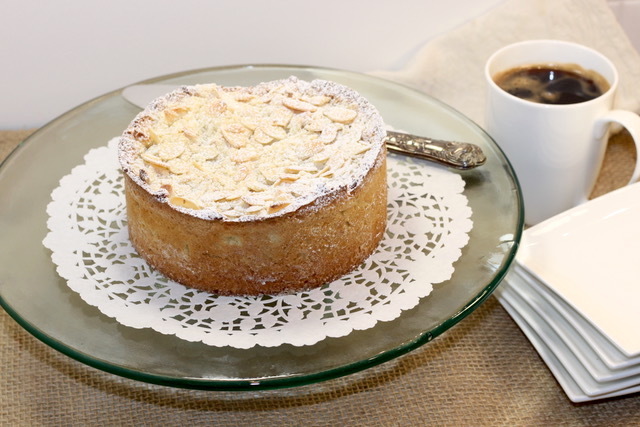 For the Topping: In a small bowl, combine the reserved crumbs with the ½ cup sliced almonds. Sprinkle over the top of the cake. Bake in the preheated oven for 45 to 55 minutes, or until the cream cheese filling set and the crust is golden brown. Cool on a rack for 30 minutes. Refrigerate until required. Once chilled, remove the sides of the pan. To garnish, dust lightly with icing sugar. Cut into wedges and serve. Be sure to refrigerate any leftovers. NOTE: For the photograph, I used a 6” cake ring + 8 muffin cup size cakes. For the individual muffin size cakes, I used a medium size scoop to portion the batter and created a well in each to accommodate 1 ½ – 2 Tablespoons of cream cheese batter. After that step, I then topped each with 1 heaping teaspoon of raspberry preserves before sprinkling evenly with topping ingredients. Bake for 20 minutes. For the photograph, I used a 6” cake ring + 8 muffin cup size cakes. 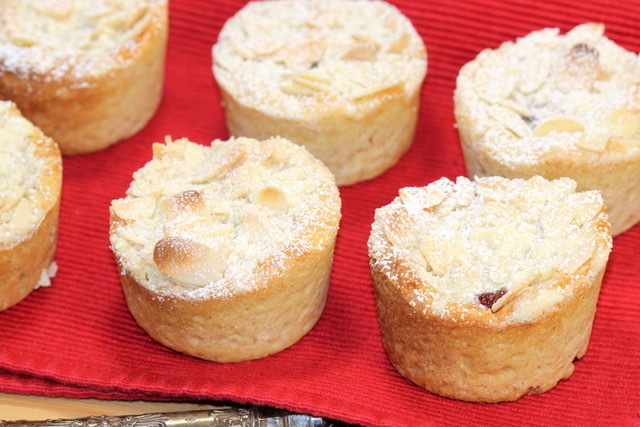 For the individual muffin size cakes, I used a medium size scoop to portion the batter and created a well in each to accommodate 1 ½ – 2 Tablespoons of cream cheese batter. After that step, I then topped each with 1 heaping teaspoon of raspberry preserves before sprinkling evenly with topping ingredients. Bake for 20 minutes. 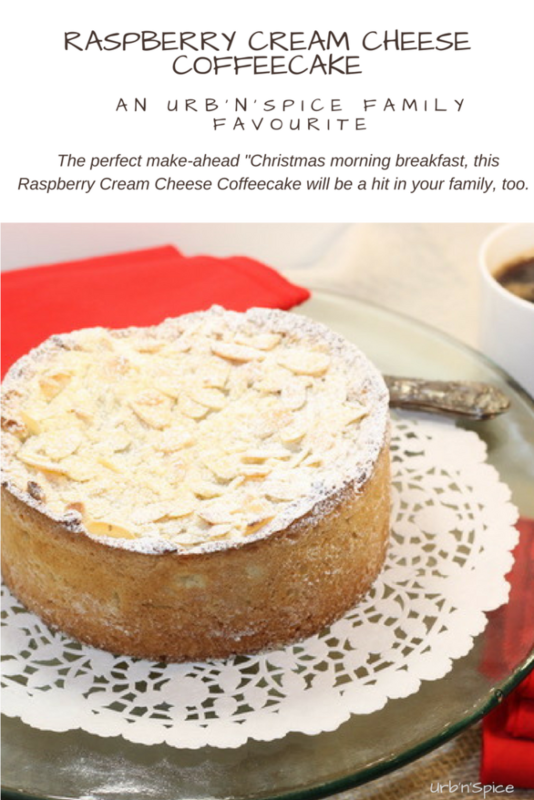 If you try this recipe for Raspberry Cream Cheese Coffeecake, please leave me a comment below with your feedback – just be sure to tag @urbnspice and #urbnspice so I am sure to see it. Enjoy! Yummy! This cake is making my mouth water, Denise. I will have to give this recipe a try. Can I also add other nuts to the topping?